The Black-capped chickadee is a bird named after its own call or song. 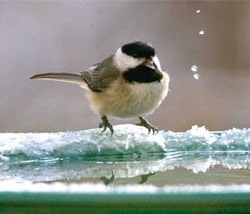 Like the Jay, Crow and other name-sayer birds, the chickadee’s common call, Chicka dee-dee-dee is easy to identify. It alerts other chickadees when good food available, helps reunite separated flock-mates, or signals “all clear” when danger has passed. But, at the beginning of the year I always wait for the loud whistled fee-bee-beeyee chickadees use to announce the beginning of nesting season. At the end of January chickadees begin to explore potential nest sites (bird houses) so that as soon as the flocks break up for breeding, each pair can claim a territory within their home range. Their melodious sweet-ie song is heard beginning on sunny February days and continues into March when chickadees dispute territory rights. The loud whistled fee-bee-beeyee songs become a familiar sound as male chickadees engage in prolonged fee-bee battles with their male neighbors. That’s when you know spring is here!